ARM processors have two main states they can operate in (let’s not count Jazelle here), ARM and Thumb. These states have nothing to do with privilege levels. For example, code running in SVC mode can be either ARM or Thumb. The main difference between these two states is the instruction set, where instructions in ARM state are always 32-bit, and instructions in Thumb state are 16-bit (but can be 32-bit). Knowing when and how to use Thumb is especially important for our ARM exploit development purposes. When writing ARM shellcode, we need to get rid of NULL bytes and using 16-bit Thumb instructions instead of 32-bit ARM instructions reduces the chance of having them. The calling conventions of ARM versions is more than confusing and not all ARM versions support the same Thumb instruction sets. At some point, ARM introduced an enhanced Thumb instruction set (pseudo name: Thumbv2) which allows 32-bit Thumb instructions and even conditional execution, which was not possible in the versions prior to that. In order to use conditional execution in Thumb state, the “it” instruction was introduced. However, this instruction got then removed in a later version and exchanged with something that was supposed to make things less complicated, but achieved the opposite. I don’t know all the different variations of ARM/Thumb instruction sets across all the different ARM versions, and I honestly don’t care. Neither should you. The only thing that you need to know is the ARM version of your target device and its specific Thumb support so that you can adjust your code. The ARM Infocenter should help you figure out the specifics of your ARM version (http://infocenter.arm.com/help/index.jsp). As mentioned before, there are different Thumb versions. The different naming is just for the sake of differentiating them from each other (the processor itself will always refer to it as Thumb). Thumb-1 (16-bit instructions): was used in ARMv6 and earlier architectures. Thumb-2 (16-bit and 32-bit instructions): extents Thumb-1 by adding more instructions and allowing them to be either 16-bit or 32-bit wide (ARMv6T2, ARMv7). ThumbEE: includes some changes and additions aimed for dynamically generated code (code compiled on the device either shortly before or during execution). Conditional execution: All instructions in ARM state support conditional execution. Some ARM processor versions allow conditional execution in Thumb by using the IT instruction. Conditional execution leads to higher code density because it reduces the number of instructions to be executed and reduces the number of expensive branch instructions. 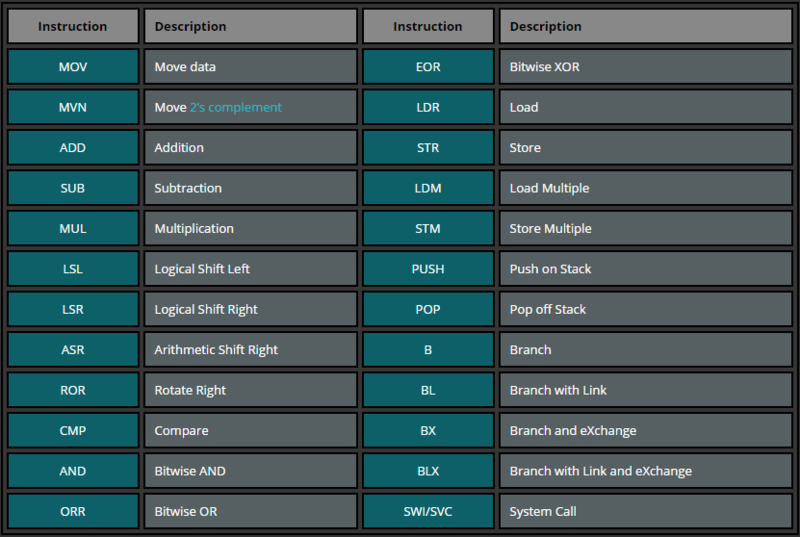 32-bit ARM and Thumb instructions: 32-bit Thumb instructions have a .w suffix. We can use the branch instruction BX (branch and exchange) or BLX (branch, link, and exchange) and set the destination register’s least significant bit to 1. This can be achieved by adding 1 to an offset, like 0x5530 + 1. You might think that this would cause alignment issues, since instructions are either 2- or 4-byte aligned. This is not a problem because the processor will ignore the least significant bit. More details in Part 6: Conditional Execution and Branching. We know that we are in Thumb mode if the T bit in the current program status register is set. The purpose of this part is to briefly introduce into the ARM’s instruction set and it’s general use. 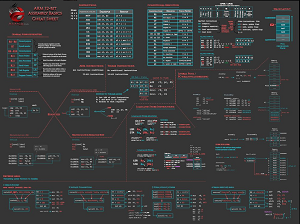 It is crucial for us to understand how the smallest piece of the Assembly language operates, how they connect to each other, and what can be achieved by combining them. #123                    - Immediate value (with limited set of values). As a quick example of how different kind of instructions look like, let’s take a look at the following list. MOV   R0, R1, LSL #1     - Moves the contents of R1 (Operand2 in a form of register with logical shift left) shifted left by one bit to R0 (Rd). So if R1 had value 2, it gets shifted left by one bit and becomes 4. 4 is then moved to R0. As a quick summary, let’s take a look at the most common instructions which we will use in future examples.